I love a good mirror. Not in a vain way, in that respect I avoid mirrors! But I love how a mirror can completely change a space, creating more light, different views, how it feels and so on. In events sometimes they have the ability to look tacky, I know you’re probably only looking at this to see what my tacky taste is… I’ve sussed you out! 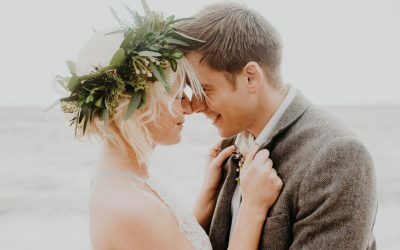 I thought I’d put together a few ways in which you can incorporate mirrors in to your wedding decor because they can bring elegance, some class, and a bit of fun if done right! All image credits are at the end if you fancy anything specific! Firstly, using mirrors as signs. This is one of my favourite ways to incorporate mirrors. There are so many options and they can completely change the vibe. They are also a really good way to open up a space, or create the illusion of more space – it’s a win win! Secondly, using them as table plans. Probably the one that you’ve seen the most! 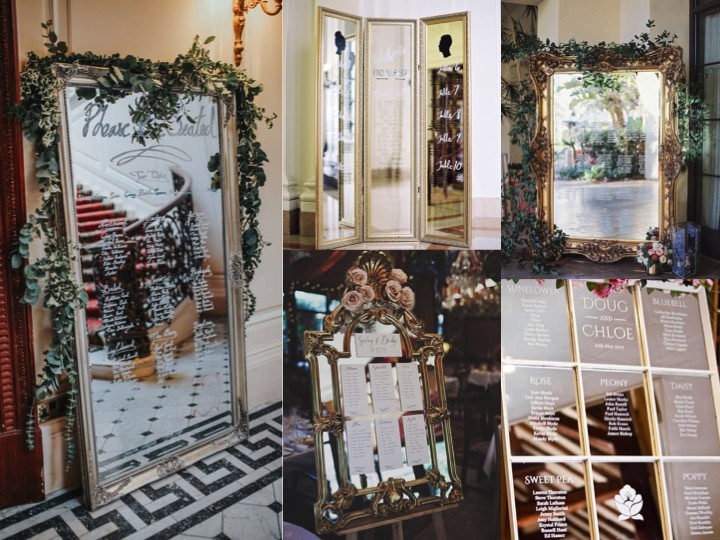 No matter what you’re going for, you can choose a mirror that suits your theme and venue and it makes the searching for your name bit a little more fun! This adds a pretty element to your decor without being too bold. Next, mirrors as table numbers. A small but mighty way to use mirrors! Delicate, or bold, or both. 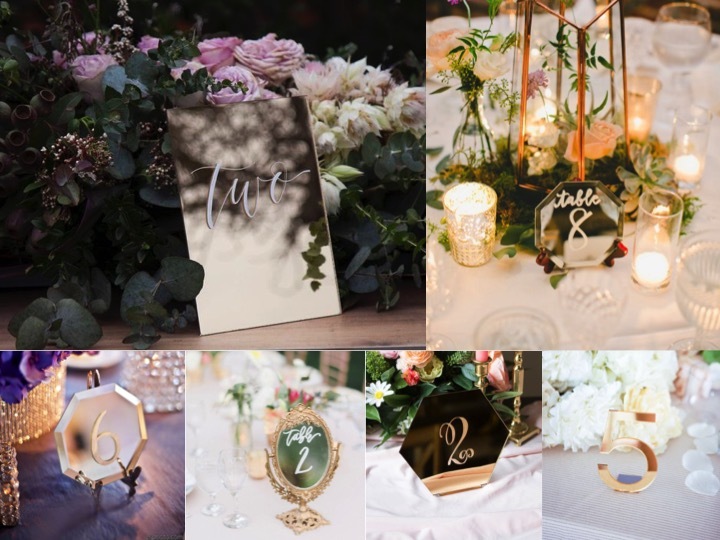 Using a mirror as a table number means it can reflect the theming you’ve chosen for your tables, quite literally, with no extra effort! Fourthly is using mirrors as centrepieces. This is a really clever way to open up your tables, make them seem more spacious and make your decor go further! You don’t have to put much on them to make an impact and you can choose various styles of mirrors to give you different feels. Most hire companies will stock mirrors but also, you can pick up bathroom mirrors pretty cheaply and use them! And then there’s using mirrors in your smaller decor details. A pretty, modern way to decorate and the options are endless! 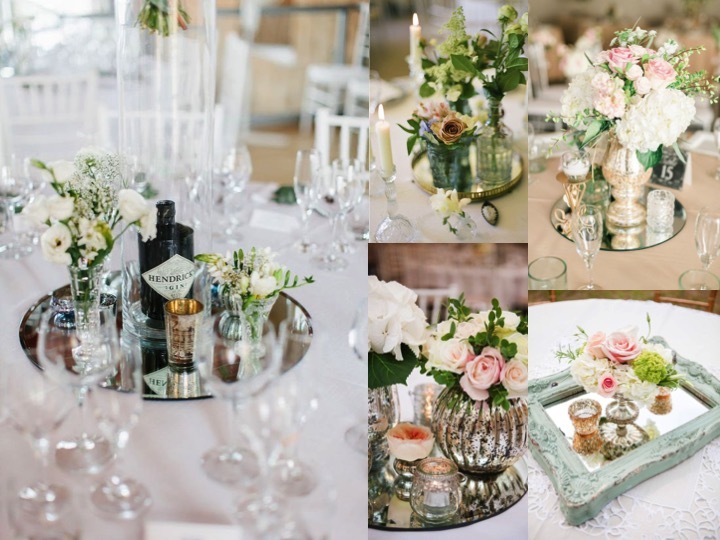 So easy to fit in to your theme, colour palette and general vibe! Mirrored objects, mirror walls, mirror discs, mirrors themselves, or disco balls – the queen of the dance floor! 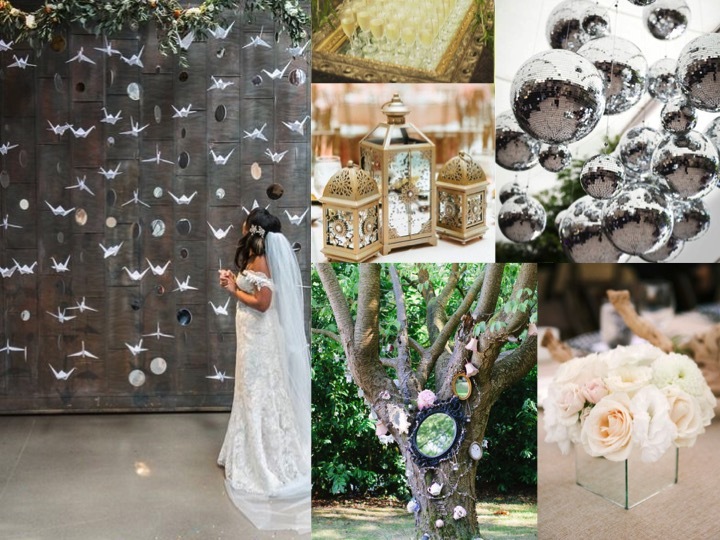 Top right of this mood board is disco balls done right if you ask me! The finally, mirrors as larger decor instalments! 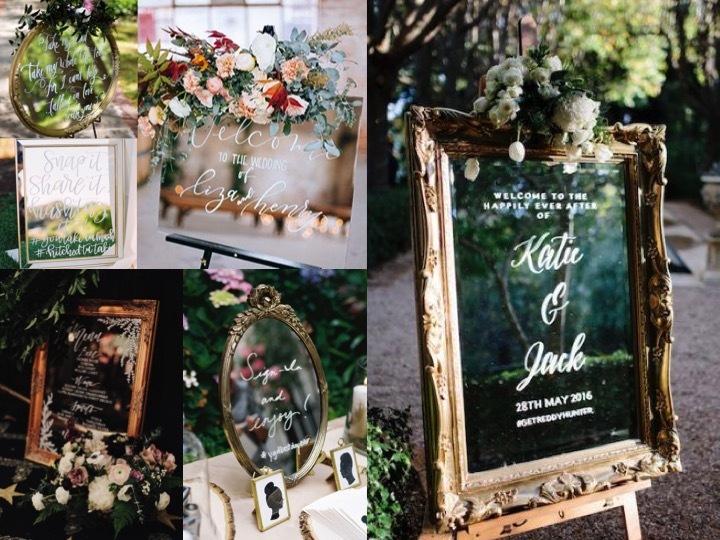 One of my favourites, I love an old school iron mirror and I am in love with the ceremony set up top left of this mood board. 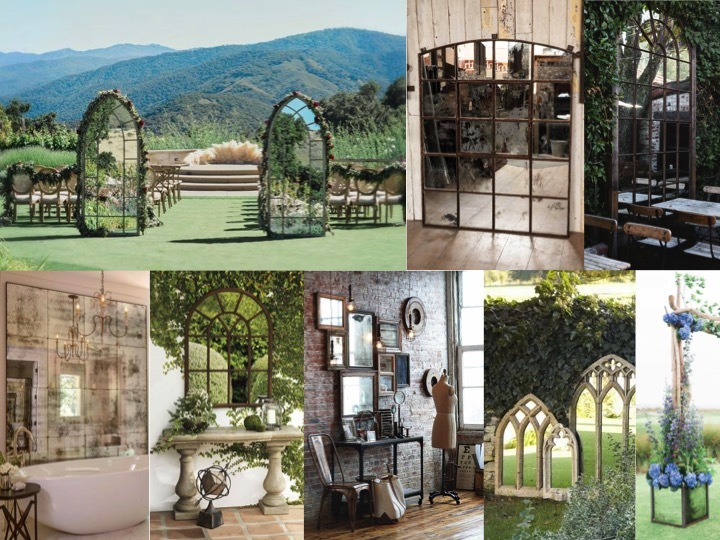 These are the best to use in order to completely transform a space, and you might be able to tell that I think they work so beautifully with greenery and nature! 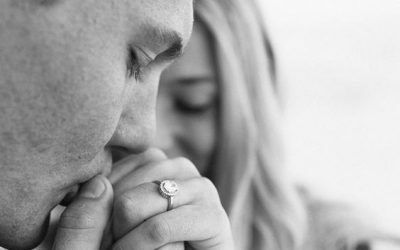 Hopefully that’s inspired you in how to use mirrors in your wedding and I mean after seeing those, why wouldn’t you?! Feeling like you don’t know how to pull all your ideas together or not know where to start? Get in touch to find out more about my styling package. Go find some inspiration in mirrors!